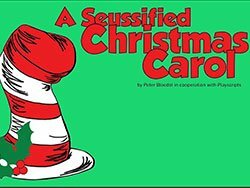 Just in time for the holidays, the Hastings College Alpha Psi Omega theatre honorary is set to produce “A Seussified Christmas Carol,” it’s annual production for youth. With zoot fruited juices and binka bird geese, from Bed-Headed Fred to Timmy Loo Hoo, this tale of glorious holiday cheer is similar to something Dr. Seuss might have come up with — if he ever had his way with the story. Catch the show Thursday and Friday November 29 and 30 at 7:30 p.m., and Saturday, December 1 at 2:00 and 7:30 p.m. at Scott Studio Theatre (806 N Turner Ave.). All tickets are $5 and can be reserved at tickets@hastings.edu. Directed by Randi Scoggins, a senior theatre major from Hastings, Nebraska, the whimsical reinvention of Dickens’ most beloved Christmas story is fun for all ages.